Most people are surprised to learn just how easy it is to build an airplane. Ultralights such as the Affordaplane are even simpler to build than most. It was designed that way from the beginning. Having the knowledge to do basic tasks such as cutting, drilling, bending metal and sanding are all that is needed to end up with a finished product that you can be proud of. As our airplane is mostly all aluminum, (with 4130 steel wing attach fittings we will discuss later) let’s focus on aluminum to start. All of the aluminum used on the Affordaplane (and almost all other ultralights too) is made of 6061-T6 aluminum. This type of aluminum has all around good characteristics, is easy to cut and bend, and comes with an anodized coating to protect it. It is impervious to rust and corrosion, and this kind is used for all kinds of applications, from truck bodies to bridges, and other architectural structures. It is also available nearly everywhere. Compared to 4130 steel, aluminum cuts ‘like butter’. Lucky for us! Thin aluminum sheet, up to about .016 inch thick, can be cut with regular scissors. But don’t plan on using them for anything else after that, because they dull quickly. For thicker sheets, up to about .035 thick, you can use a paper cutter. This gives nice long, straight cuts. There are a lot of small parts that need to be made, and twenty years ago any airplane shop worth its salt had to have a band saw. If you are building a single airplane, then you really don’t need one, but it does make things go faster. 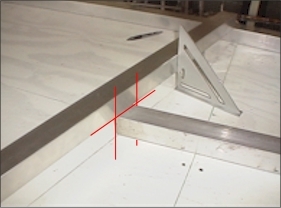 The A-Plane uses a lot of .125 inch (1/8 inch thick) aluminum plate. Cutting this material is made easy with a common jigsaw. You want to use a blade that is fine-toothed so you make smooth cuts. There is only one thing you need to do to your jigsaw before cutting. You need to put tape on the shoe (the flat part that contacts the metal to keep it at 90 degrees to what you are cutting). This protects your metal from being scratched. Duct tape works well, and scotch tape (wide strapping) tape works even better. Now its time to lay out the parts on the material you are cutting. Since most people build their fuselage first, let’s use that as our example. First, you will make paper templates from your plans, as our plans have full-size templates, you can just make copies and use these. The heavier the paper, the easier it is to trace around it. The diagram below shows a typical layout for the fuselage gussets. 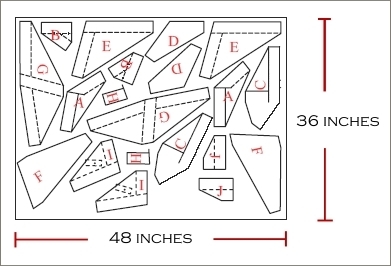 ALL of the gussets for the fuselage can easily be cut from one single sheet of .125 inch aluminum, 36 inches by 48 inches! 1) Using as much of the material as you can, without wasting a lot. 2) Leaving yourself enough space so that you can comfortably cut around the parts. Once you are satisfied with the placement of your parts, you attach them to the aluminum with double-sided tape. Then, using a fine pointed Sharpie style marker, you draw the shapes onto your material. Now remove the paper templates. The tube on the bottom is the one being marked for cutting. Using the top tube as a reference, you mark that angle where it crosses on the bottom tube. Then you take the speed square and draw the lines as shown in red. Now you have three sides marked, the angle is perfect, and all we need to do is cut it. What is the easiest way to cut square tube? 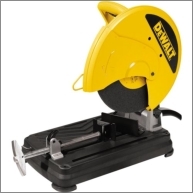 With this: A chop saw with a metal cutoff blade. These saws have really come down in price in the past few years, and blades can be had for under $5.00. Cutting only aluminum with them they last a long time. If you mount the saw on a long table and provide support at the other end so that the tube being cut is at 90 degrees to the blade, your cuts will be perfect every time! 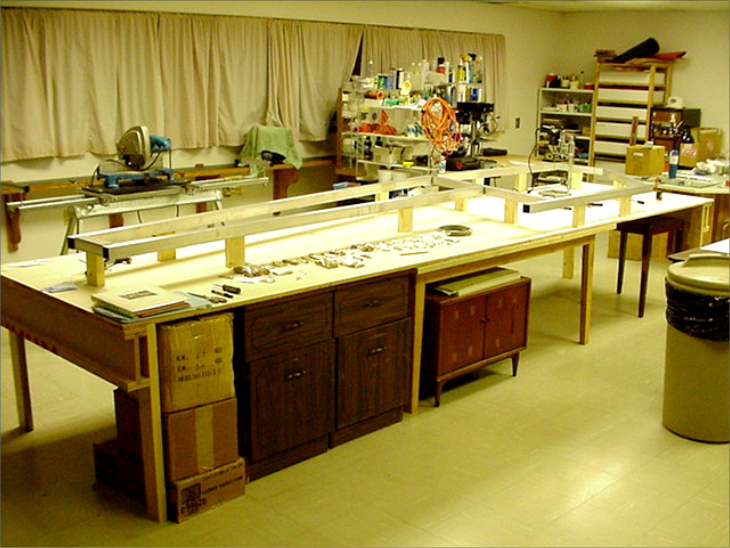 Be sure to leave yourself a little room so that you can dress and finish the tube by sanding. To finish the part, we need to file and sand the excess material right down to the lines we drew. This step is very important, not just so the parts fit together correctly, but also because this step makes the difference between a very nice airplane, that everyone will compliment you on, OR a train wreck where everyone will try and ‘save you’ from flying it! It does not take any extra time to do it right, to do it as perfectly as you can. In fact, you will make your job of finishing the aircraft much easier, and you will feel confident and safe when you fly it. Painting it will also be much easier. Our goal is to finish the part by making it smooth, shiny, and with no nicks or scratches which can cause stress marks. It is advisable to use one that has a wide belt, as the small one inch ones get eaten up pretty quickly. The parts being sanded can get pretty hot, so it is helpful to hold the part with vice grips or something similar. Once you are comfortable with the dimensions of your part, now we can finish it. Using a hand file, and emery cloth, smooth all of the edges so that when you run your finger across it, you will not feel any nicks or dents, and the overall finish is smooth and even. You also want to make sure that there are no burrs anywhere. Once your part is finished in this way, to make it a useful airplane part we need to drill it. This will be the focus of our next workshop. Thanks for visiting, and happy flying!